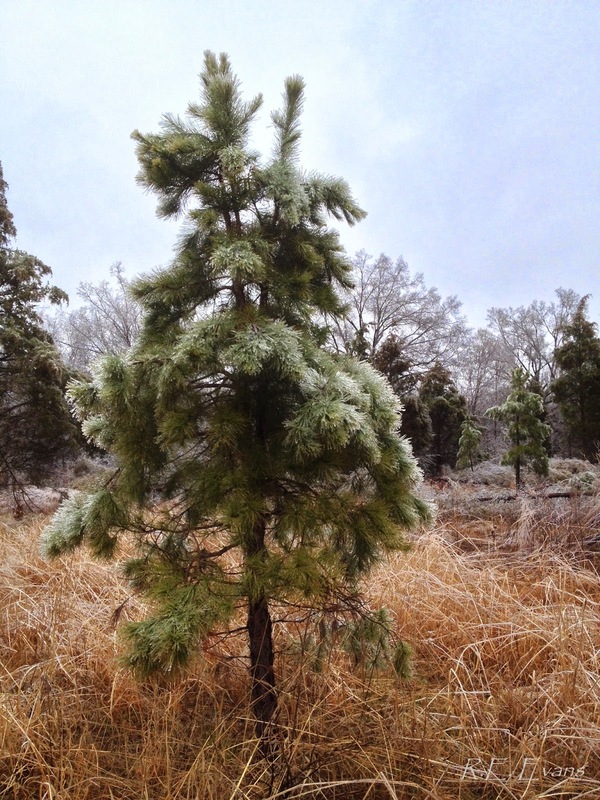 Increased attention is being focused on shortleaf pine by some foresters, ecologists, and restoration practitioners. 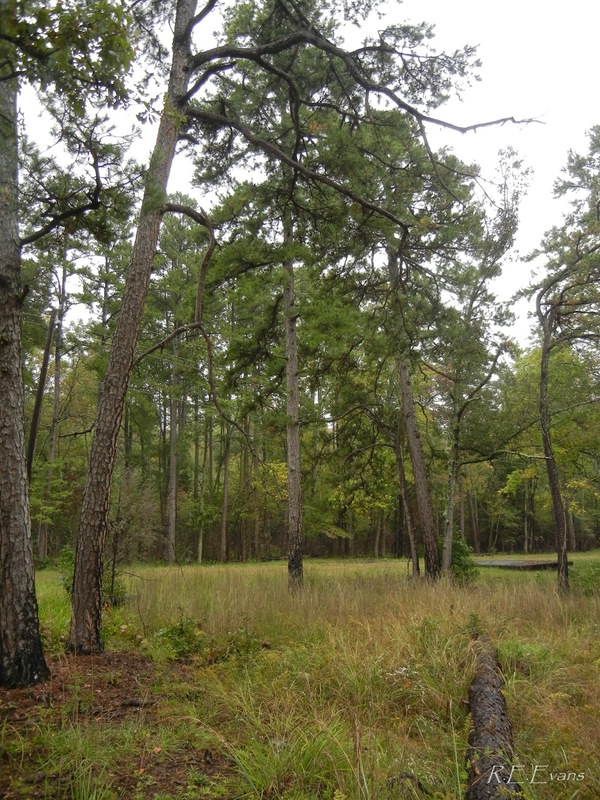 An ongoing debate centers on how much shortleaf was present historically relative to the other native pines and hardwoods. We may never know the answer, however, it seems probable in our region (N.C. Piedmont) that mixed forest prevailed. According to Pinchot & Ashe 1897, "....no areas in the original forest...produce pure growth of either"
Although the preceeding map shows shortleaf ranging into the outer coastal plain there is general consensus that most of this area was historically dominated by other vegetation, especially longleaf pine woodlands and savannas. However, in the Piedmont there are intriguing "remnants" of shortleaf woodlands or savannas which share structural and compositional similarities with longleaf pine communities. 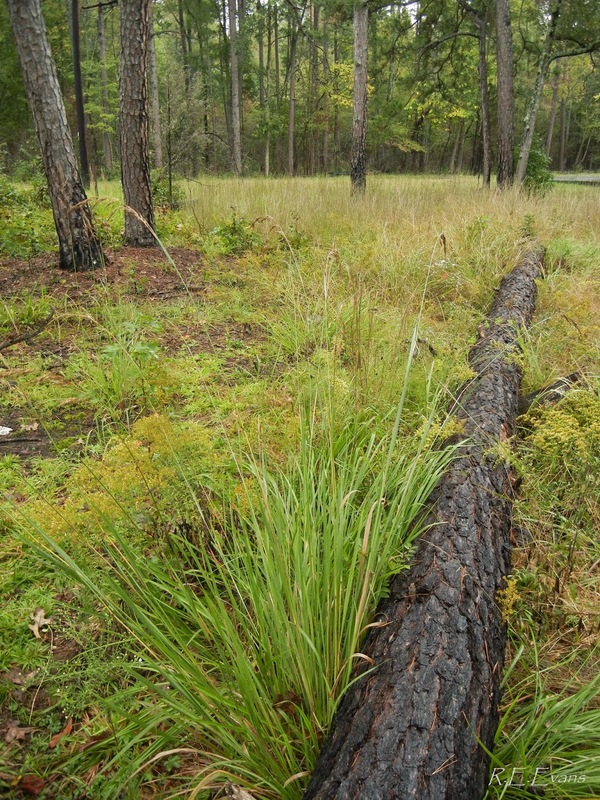 There is growing recognition that prescribed fire is an important management and ecological restoration tool in many shortleaf pine stands. To return long-suppressed stands to more open condition (such as the images above) frequent, regular fire is desirable. We try to burn these areas in the early spring on a 2-3 year rotation. 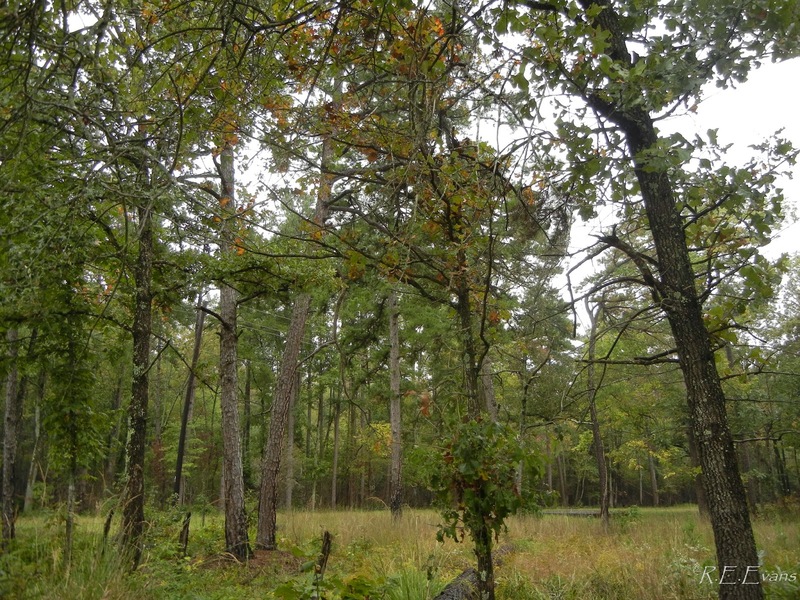 In the stand above, the nearly closed canopy from abundant oaks, especially Southern Red Oak (Quercus falcata), allows only patchy sunlight to reach the forest floor. Although fuel conditions were quite dry, the lack of sunlight penetration and wind movement underneath the trees and relative humidity in the high 30's fostered slow moving low flames and incomplete ground coverage. 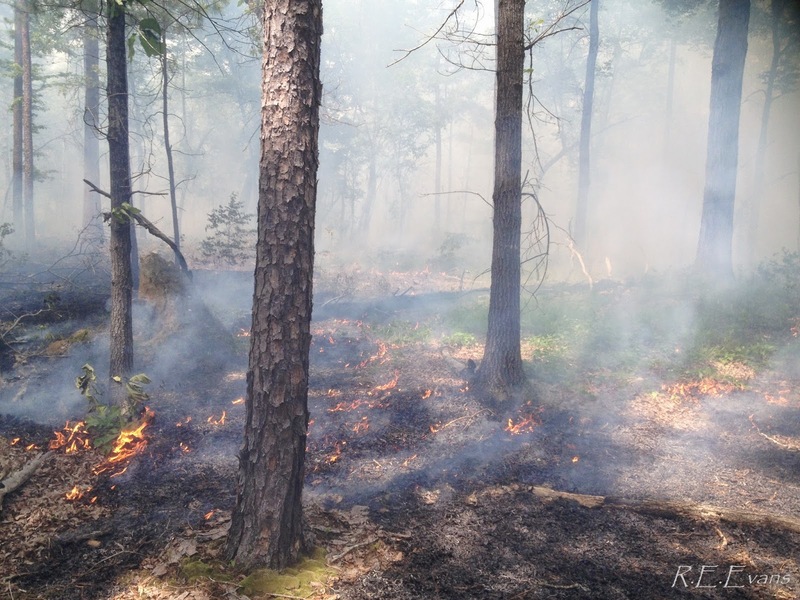 May 2014 Prescribed Fire in Shortleaf Pine - Oak Forest. Poverty Oat Grass (Danthonia spicata) is abundant and flowering in the left side of this view. Patches of live green vegetation contributed to patchy coverage of this growing season burn. Shortleaf Pine sapling on site burned ~ biennially for 10 years. possibly explaining its more northerly distribution.